This year The Throwdown is bigger and better than ever! This live art and silent auction showcases five local artists vying for the title of Throwdown Champion: 2017 winner Devlin Wilson, 2016 winner Ardith Goodwin, Cat Pope, conz8000, and Ben Kaiser. Each artist will create works of art in just 90 minutes using a shared supply table. When the time is up these pieces will be available for purchase in our live auction. During the competition, an array of items will be available for purchase in our silent auction, including overnight stays, entertainment packages, gift cards, and, of course, great local art! Attendees will enjoy live music by Yeah, Probably, food by Heroes and Royal Scam, beer by Haint Blue Brewing Company and additional beverages to ensure an entertaining evening. 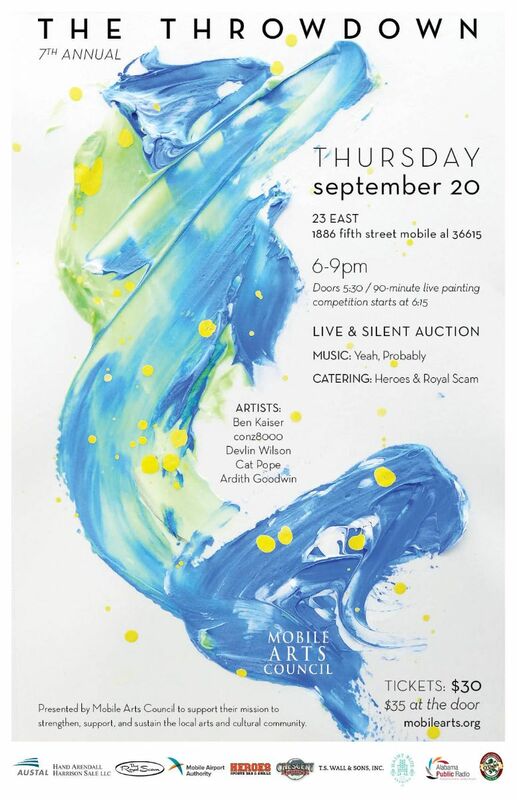 Many thanks to our venue sponsor for hosting this unique event at 23 East (located at 1816 Fifth Street, Mobile, AL), as well as additional sponsors Austal USA, Hand Arendall Harrison Sale, LLC, Cresent Theater, T.S. Wall & Sons, Inc., Alabama Public Radio, and O'Daly's Irish Pub.